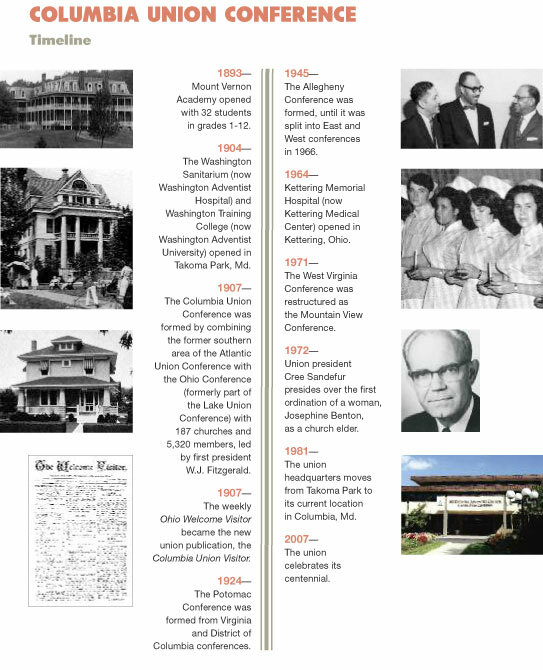 A lot was going on in the world, in 1907, when the Columbia Union Conference was established. Imperial Russia instituted representative government with mixed results, electing both the second and third Duma (parliament). Neighboring Finland held its first parliamentary elections and the first elections anywhere in which universal suffrage was guaranteed. Women not only voted, but also ran for office. New Zealand and Newfoundland became self-governing dominions of the British Crown. Korea became a protectorate of Japan, leading eventually to outright occupation. The United States succeeded in averting a major financial crisis, such as what took place in the mid-1890s and in 1929, thanks to the foresight of such industrialists as J.P. Morgan. And the Indian and Oklahoma territories united and became the state of Oklahoma. There were also cultural and social milestones: Robert Baden-Powell opened the first Boy Scout camp on Brownsea Island, England; Maria Montessori started her first school and day-care center in Rome, Italy. While not a year for major inventions such as the light bulb and telephone, 1907 witnessed the advent of technologies still in use today. Among them are the Hoover vacuum cleaner, the first steps toward color photography, Lee Forrest’s triode thermionic amplifier that made electronics feasible on a large scale, and metered taxicabs (London). At this time the Seventh-day Adventist Church was still recovering from the upheavals of the late 19th and early 20th centuries. Co-founder Ellen White was alive and providing prophetic guidance for the church’s activities. John Harvey Kellogg was formally dropped from membership at the Battle Creek Seventh-day Adventist Church, bringing that phase of church history to a conclusion. Alonzo T. Jones, a major figure in the 1888 controversies, had his ministerial credentials revoked. Louis Sheafe, an African-American pastor in the Washington, D.C., area, temporarily removed his congregation*the Peoples Church*from conference organization in protest against certain church policies. And a special session of the General Conference (GC) Committee was held in Gland, Switzerland, to address the needs of the expanding Adventist presence in Europe. Above all, 1907 was a transitional year for the church. Much of it involved the shift from Battle Creek, the official center of church activity, to Takoma Park, Md., and Washington, D.C.*which became parts of the Columbia Union Conference that same year. The decision to move the main Adventist institutions to the eastern United States had been made as early as the 1903 GC Session in Oakland, Calif. White pointed out and wrote that, “The advantages of Washington, D.C., should be closely investigated.” Church officials began to relocate to the Washington area, initially working from rented properties. By 1907 White’s vision for Washington as an urban center for Adventist activity began to take shape. Washington Sanitarium*now Washington Adventist Hospital*admitted its first patients in the summer of 1907. The Washington Training College*founded in 1904*expanded and became Washington Foreign Missionary Seminary, then Washington Missionary College, and, still later, Columbia Union College. The Columbia Union Conference was voted in the spring of 1907, part of ongoing reorganization of the church into “union conferences.” (It was based on the successful model of the Australian Union Conference.) Prior to this, all church matters that couldn’t be handled at the local or conference level were managed*or micromanaged*by the General Conference Committee. This was satisfactory to no one. GC officials felt that local matters were too much of a drain on their time and attention. And others*including Ellen White, who warned about “kingly power” and “Jerusalem centers”*felt that too few people had too much authority. Several union conferences had already been organized by 1907 when the GC Committee, while meeting in Gland, Switzerland, on May 15, voted “that the Atlantic Union Conference be requested to ... reorganize ... to form two union conferences.” The new territory was to be named “the Columbia Union Conference” and “composed of the conferences in the states of Pennsylvania, New Jersey, Delaware, Maryland, Virginia, and West Virginia.” Also, “the Lake Union Conference” was “requested to release the Ohio Conference, to become a part of” the new union conference (GC Committee Minutes, 1906-1908, pp. 151-152). The major reason for a new union conference was to focus more missionary activity and resources within the large cities of the mid-Atlantic region. Up to this point, the Washington metropolitan area was not included in any conference; it was attached directly to the General Conference and administered through a special evangelism committee. And there were only small, struggling city missions in Baltimore, Philadelphia, and Newark. After the Atlantic and Lake union conference executive committees assented to this recommendation, an organizing session for the new union conference was convened in Philadelphia at 3 p.m., November 17. There were less than 50 delegates, but all seven conferences were represented, including members of the Washington evangelism committee. The voted resolutions presented a number of goals, several of which are still a central focus for the Columbia Union Conference today. “The people of the great cities in this field,” was the first priority mentioned, with a “call for the consecration of every resource to service” and the objective to “press our work into unentered portions of our field ... in the great centers of population.” Special attention was pledged to “mission work among the Jews and Italians,” the major immigrants in these cities at the time. The delegates voted that “full departmental organization of our work” be implemented as quickly as possible with people to be assigned to oversee “publishing, educational, medical missionary, religious liberty, and young people’s missionary volunteer departments.” Also, “a general missionary secretary” was to be funded jointly by the Review & Herald Publishing Association and the new union conference. The conferences were urged “to hold institutes for church elders and deacons” to provide training for local church outreach and nurture. Youth ministries, which came into existence earlier in 1907, was to be given special attention. Efforts were underway “to encourage all of our young people to obtain a preparation in our schools for some branch of the work.” Mount Vernon College was designated as the union college since Columbia Union College then belonged to the GC as a seminary to train missionaries going overseas. A goal was set to seek “better patronage” for “our sanitariums” (hospitals) through greater marketing efforts. Another goal was to raise “an amount equal to 10 cents a member each week” (about $10 today) for world missions. The group also voted that the Ohio Welcome Visitor, the weekly Ohio Conference newsletter, become the new union publication. The delegates elected three officers: president, W. J. Fitzgerald; vice president, H. H. Burkholder; and secretary/treasurer, E. R. Brown. Three pastors and a physician were elected to the executive committee, with an additional slot to be filled by the committee. The 1908 Yearbook was the first to record information about the Columbia Union Conference. At the time, it consisted of seven conferences: Chesapeake, East Pennsylvania, New Jersey, Ohio, Virginia, West Pennsylvania, and West Virginia. Total membership was 5,320 attending 187 churches. Paid employees included 43 ordained ministers, 23 licensed ministers, and 59 licensed missionaries. In 1924 the Potomac Conference was formed from the Virginia and District of Columbia conferences. A regional conference, Allegheny East, was formed in 1945. A second, Allegheny West, was voted in 1966. Then in 1971, the West Virginia Conference was restructured as the Mountain View Conference. From those beginnings, the Columbia Union Conference has increased its membership exponentially, now claiming nearly 140,000 members worshipping in nearly 800 churches, served by some 400 pastors. There are 90 elementary and secondary schools, a health sciences college, a university and two healthcare networks.